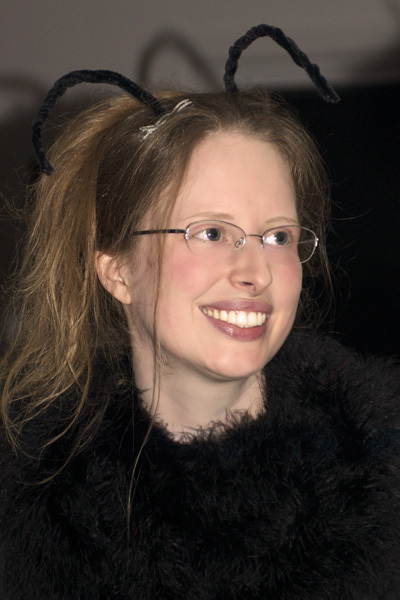 Connecting with her essential passion for insects and photography, Elise Fog began taking portraits of bee behavior in Oregon’s beautiful McKenzie River Valley in 2009, leading to her regenerative work in the world, in the form of her fervent bee advocacy at savebees.org. Here she carefully curates information that enables us all to acquire a deeper knowledge of bees and to take action on their behalf. She is also cultivating a native wildflower habitat in her garden, and is encouraging others to establish similar pollinator habitats. She asks us all to take one or more small actions to save these pollinators that are so vital to our food system and to the beauty and diversity of our Earth. At an early age, I remember feeding sugar water to the ants in my parents’ front garden, carrying dead beetles I’d found around in matchboxes, and generally spending a great deal of time outdoors observing the teeming, miniature lives around me. One time, when I was still very young, I remember seeing a woodlouse (also known as a pillbug or sowbug) walking across the pavement. I’m afraid to say that I ran it over purposefully with the wheel on my trike. It was a sad and formative moment. I realized, much to my dismay, that I could not put the bug back together again. Ever since then, I’ve had the greatest respect for all living things, and have never purposefully killed another bug (nor harmed a living plant). Flies, ants, wasps, moths, silverfish, spiders, and the like… each one is transported outside gently in my ready-to-hand bug catching device! I’ve also had a strong interest in photography throughout my life. As a family, we went on many road trips into the desert areas around California, and the first thing we would do upon leaping from the car was to take plenty of photographs of the wild scenery around us. I also spent a summer wandering the dirt roads of southwestern Arizona in my car with a friend. I remember seeing a velvet ant once while driving slowly along… my old Honda was not made for dirt roads, but slow speed has its benefits, as I saw this bug (actually velvet ants are wasps, colorful furry wingless ones) while driving, and promptly leapt out to take its photograph! For the most part, insects were few and far between in the desert, so I took plenty of photos of cactuses, canyons and sunsets too. One of the most interesting trips I took was to Trinidad and Tobago on a university course (while still in high school). In the lush rainforest, I was surrounded by insects and arachnids of all kinds… much larger than the ones in North America! Giant iridescent green beetles, massive furry tarantulas… real fireflies, which I’d always wished to see, and about which I’d only read until that point. Before leaving, I had purchased a set of close-up filters that screw onto the front of a camera lens… not the greatest setup in terms of quality (bellows or dedicated macro lenses are better), but it allowed me to get close-up shots, and the style of shooting is similar to how I photograph these days. My macro lens, just like these old magnifying filters, requires me to get very close to my subjects, within a few inches. Bees have always been a particular favorite of mine. They’re fuzzy and cuddly looking, and I think that helps! Unlike butterflies or ladybugs (who dislikes these? ), bees are often feared, swatted at, and confused with wasps (in fact, most wasps are just as gentle as their bee relatives). I recently read that in Los Angeles, beekeeping was banned in the late 1880s, in part because people thought that honeybees stung the fruit! When I stayed in Arizona that one summer, one of my favorite subjects was the giant iridescent blue-black “tarantula hawks”, with bright orange wings… these are really very large wasps! I stood in clouds of these without fear, in order to take their photographs… all one need do is to pay attention, stay out of flight paths, not move aggressively, and carefully observe their habits before choosing the best photographic approach. 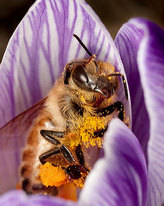 And so it is that my close observation of bees in particular (through my photography) has led to my advocacy for them. The photos that catalyzed my move into “bee activism” are a set I took when I first received my digital macro camera equipment as a gift in August of 2009. I had been honing my insect photography skills prior to that time on a point-and-shoot camera (my first digital camera) that I received in 2006, which had a decent macro mode, but I’d never been able to approach the level of detail that a professional camera with dedicated lenses could offer. I’d learned a lot though, especially about how close observation of behavior could reward one with opportunities to capture unusual and desirable shots. What made this particular photo shoot notable was that it was the first time I saw mites attached to many of these individual bees. Unwittingly, I had captured several shots showing playful bumblebees with such mites, but I didn’t see them until later when I loaded the photos onto my computer and saw them enlarged. I was so surprised when I enlarged the photos, and began research that day. I learned that while these particular mites were not typically harmful to bumblebees, their relatives, Varroa destructor, are extremely detrimental to honeybees. Sadly, our honeybees are suffering the plight of a mite that humans have imported accidentally from Asia, and which is now spread throughout most of the world (Australia is one of the few remaining places it has not yet colonized). And our honeybees have not had the time to adapt that Asian honeybees have, the latter having evolved over time in the presence of these mites, and having developed mite-mitigation behaviors, such as picking them off each other. Pesticides in our environment also weaken bees’ immune systems and make them far more susceptible to diseases and parasites. This and other close photographic encounters since then, coupled with my ongoing research, have led to the deep connection I feel with all bees, and my resulting passion to share their world and their current plight. I particularly love the solitary and semi-social bees (and bumblebees, which live in colonies far smaller than honeybees). I avoid the easy macro shots of cold, still bees in the early morning or late evening, instead aiming to capture the active shots, to provide windows into the fascinating world that I see when I’m looking at these bees from behind my lens. Most of the behaviors I have observed center around their foraging as well as their grooming behaviors. I also love to observe bees’ nocturnal habits, and two of my most popular blog posts are on that topic: Where Bumble Bees Sleep at Night and Where Solitary Bees Sleep at Night. All the insects I’ve photographed make their home in the McKenzie River Valley in Southern Oregon (west of the Cascades), between Eugene and Bend. These bees are, literally, all in my back garden! It’s a privilege to share my land with them, and I continually work to make my little spot a more beeautiful place by planting native wildflower habitat, and encouraging those around me to establish similar pollinator havens. See Elise's guide to Creating Your Own Wildflower Meadow for Bees. savebees.org grew out of my main enlightenedbugs.com project (which I setup in January of 2010), where I kept a blog that eventually morphed into the separate website savebees.org in 2013. I also travel to art shows sharing my photos and discussing the importance of protecting our pollinators with anyone who is interested. It helps to have huge, colorful prints of active bees in the background drawing people in. Most folks are interested, though I must say that occasionally, someone will pass by, their face slowly contorting in disgust with each fresh photo they see! Luckily, most are, if not enchanted, at least slightly fascinated… especially younger children. Many are amazed at the “bee personalities” revealed, and I see the connections (to creatures they had previously thought to observe safely from a distance) forming in these folks as they look closely at my work. At first I felt as though I was preaching to the converted (so to speak), but through these conversations I came to realize that many well-intentioned folks don’t know how to go about helping bees and other pollinators. Many bee experts believe that we’re going to lose a lot of bee species, even if we start doing things right. We’ve passed too many tipping points. with a combination of sweeping habitat loss, unwarranted pesticide use, exposure to accidentally imported viruses and parasites, and (in the case of honeybees) extraordinary stress as we truck them about cross-country, or ship them in small containers through the mail. A recent documentary that I highly recommend is More Than Honey , which provides an eye-opening view into commercial bee-keeping today within our current agricultural system. It particularly irks me that conventional food growers can dump all the chemicals they like on food and not label it. Meanwhile, organic growers have to jump through hoops paying all sorts of extra so they can label their food as not having all those chemicals… that’s just the opposite of what it should be! Monocultural farming (even if we removed all the pesticides) would still pose dire issues for pollinators in terms of habitat loss. 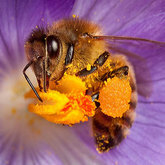 They depend on a variety of healthy sources of pollen and nectar, and they cannot fly forever trying to find it. I think we (humans) also have this tendency to try to find simple solutions to complex problems. It seems to me that advocates may fall especially prey to this tendency, as it’s far easier to motivate large groups of people and amplify your message when you’re offering a simple call to action. You have to stay hopeful and seek to change people’s perspectives (and ways of life). Even if we cannot bring back species we have lost, we can try to keep the ones that are currently on the brink, and avoid pushing other species towards extinction. When I look online, there is a great deal of information about what we can all do to save bees, but it is so spread out, and it’s mingled with a lot of misinformation too. I created savebees.org to collect much of the information in one place, filtering it to provide what I hope are some of the very best resources, with up-to-date links to petitions, movements, and other actions in which folks can participate. I also follow a large number of bee-related feeds on Twitter, and filter those too (these tweets and retweets appear on savebees.org as well). In this way, I hope to educate those who have an interest in helping our pollinators, providing informative links that show the need for action, along with concrete suggestions for ways to help, so that for any given person, there’s at least one action they can take right away to help save our beloved six-legged friends from suffering and potential extinction… be it by planting pollinator habitats, contacting your elected representatives, or choosing organic foods free from pesticides and herbicides. Learn more about their habitats and how to support them. 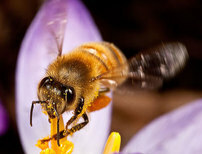 Sign a petition to save bees. Learn more about how bees support our food system and what is endangering bees.